Abstract. Calcification by coral reef communities is estimated to account for half of all carbonate produced in shallow water environments and more than 25% of the total carbonate buried in marine sediments globally. Production of calcium carbonate by coral reefs is therefore an important component of the global carbon cycle; it is also threatened by future global warming and other global change pressures. Numerical models of reefal carbonate production are needed for understanding how carbonate deposition responds to environmental conditions including atmospheric CO2 concentrations in the past and into the future. However, before any projections can be made, the basic test is to establish model skill in recreating present-day calcification rates. Here we evaluate four published model descriptions of reef carbonate production in terms of their predictive power, at both local and global scales. We also compile available global data on reef calcification to produce an independent observation-based data set for the model evaluation of carbonate budget outputs. The four calcification models are based on functions sensitive to combinations of light availability, aragonite saturation (Ωa) and temperature and were implemented within a specifically developed global framework, the Global Reef Accretion Model (GRAM). No model was able to reproduce independent rate estimates of whole-reef calcification, and the output from the temperature-only based approach was the only model to significantly correlate with coral-calcification rate observations. 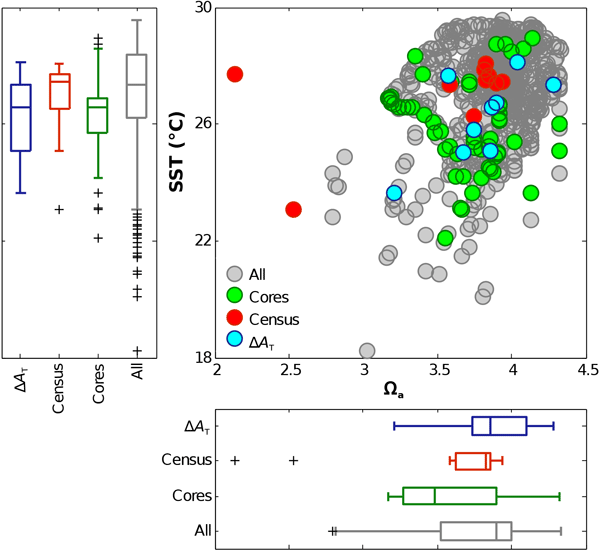 The absence of any predictive power for whole reef systems, even when consistent at the scale of individual corals, points to the overriding importance of coral cover estimates in the calculations. Our work highlights the need for an ecosystem modelling approach, accounting for population dynamics in terms of mortality and recruitment and hence calcifier abundance, in estimating global reef carbonate budgets. In addition, validation of reef carbonate budgets is severely hampered by limited and inconsistent methodology in reef-scale observations. How to cite: Jones, N. S., Ridgwell, A., and Hendy, E. J.: Evaluation of coral reef carbonate production models at a global scale, Biogeosciences, 12, 1339-1356, https://doi.org/10.5194/bg-12-1339-2015, 2015. Production of calcium carbonate by coral reefs is important in the global carbon cycle. Using a global framework we evaluate four models of reef calcification against observed values. 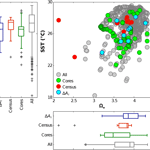 The temperature-only model showed significant skill in reproducing coral calcification rates. The absence of any predictive power for whole reef systems highlights the importance of coral cover and the need for an ecosystem modelling approach accounting for population dynamics in terms of mortality and recruitment.